2019 NCR New Blue. Picture credits - NCR. Submit more pictures. A project developed jointly with Ducati North America upon their request. 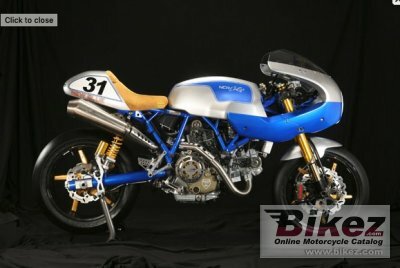 This bike is a limited edition, to be used on tracks only, and it is a homage to Cook Neilson�s 1977 Daytona victory on a Ducati 750SS, known as OLD BLUE, tuned by Phil Schilling. This was the first victory for an Italian brand in the USA, and therefore a huge boost for that market. Ignition: NCR CORSE wiring system with Automatic Remapping System (ARS) by on-board CPU . Rear suspension: Progressive linkage with fully adjustable Ohlins monoshock with length adjustment. Tuned by NCR CORSE. Instruments: AIM MXL dashboard with via Can to EFI Euro 1 cpu connection and USB PC connection. Comments: NCR Al 7075/Titanium footrests kit, NCR Al7075/Titanium fuel cap, NCR Titanium clutch cover, NCR Titanium/Al 7075 clip on set, NCR triple clamps kit in alluminum from billet, NCR CORSE bottom bracket in alluminum from billet,NCR CORSE camshaft and Magnesium NCR clutch and alternator case. Poggipolini Group production. Handmade on demand and limited to 50 numbered bikes.. Ask questions Join the 19 NCR New Blue discussion group or the general NCR discussion group. Enter your e-mail to join the 2019 NCR New Blue forum and get notification of answers and new messages about this bike. You can unsubscribe with a single click. Bikez does not display, sell	or misuse e-mail addresses. Get a list of related motorbikes before you buy this NCR. Inspect technical data. Look at photos. Read the riders' comments at the bike's discussion group. And check out the bike's reliability, repair costs, etc. Show any 2019 NCR New Blue for sale on our Bikez.biz Motorcycle Classifieds. You can also sign up for e-mail notification when such bikes are advertised in the future. And advertise your old MC for sale. Our efficient ads are free. You are also welcome to read and submit motorcycle reviews.